On New Years Eve there are glittering balls in Times Square. There are parades and galas with sequins, tuxedos, and champagne. But no one does New Years quite like Folly. The tradition continues this year, and at midnight a giant pair of lit-up flip-flops will drop at the stroke of midnight. New Years Eve 2011 marked the first year for the now-annual Flip Flop Drop. 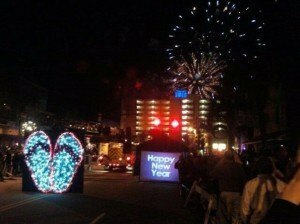 Center Street is closed for the celebration, and locals and visitors will gather to celebrate and ring in the New Year beneath a pair of lighted flip flops. There will be a traditional New Years midnight countdown, and the flip-flops will drop from the top of a hook and ladder truck at the corner of Center Street and Ashley Avenue. A fireworks display over the beach will provide the perfect start to 2013. No rain is expected for New Years Eve on Folly, but temperatures could dip into the upper 40s over night. The 95% humidity in the air will make it a damp cold, so be sure to dress warmly for your evening out. The first day of 2013 will be warmer with a high of 64 under partly cloudy skies, which is a perfect way to welcome a brand new year. Suggestion, just like time square when the ball drops and confetti falls, you should add mini flip flops falling to the big flip flops.